Is it a palazzo? A museum? A hotel? Si, si, si. The common areas, which are anything but common, are breathtakingly beautiful – frescoed walls and ceilings, Murano glass chandeliers, a dramatic marble staircase. 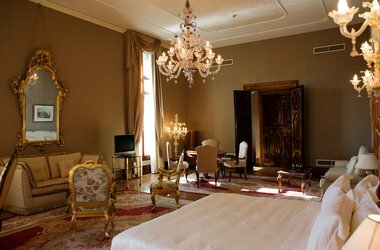 There are 42 rooms; try to reserve one overlooking the Grand Canal. Now home to L’Alliance Française and perfectly preserved with elaborate stuccos and Murano mirrors. Look for the hole in the elaborate marble floor: It came in handy for spying on those entering below. 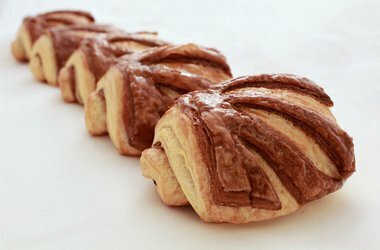 This sweet cafe has been baking fruit tarts, cream puffs, and layered pastries since 1870. For a special break from the crowd, this charming wine resort on the northern island of Mazzorbo. (Take vaporetto line 12 from Fondamenta Nove or arrange pick-up with the restaurant.) Start by wandering the island of Burano across the footbridge to see the colorful houses. 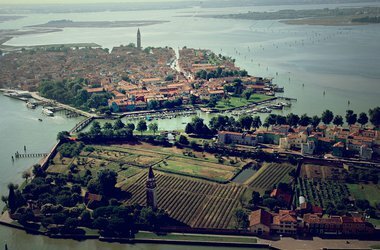 Then make your way to the grounds at Venissa, exploring the property and the 14th-century bell tower before settling into an intimate dinner in the 18-seat dining room. The artful menu updates classic Venetian dishes in exquisite presentations. Every course has a dedicated chef. If you decide you can’t possibly leave, simply stay the night in one of the six cozy guest rooms. 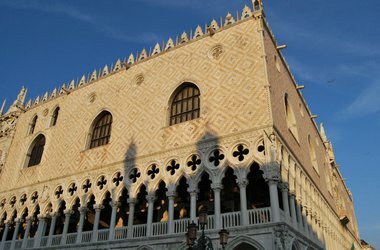 This beautiful, intimidating Gothic building is where the rulers of Venice orchestrated mysterious and nefarious power plays. The ornate Golden Staircase (Scala d’Oro) leads to the Doge’s apartments, where the best things to see are Sala del Scudo, Sala Grimaldi, Sala del Senato, the old jail cells, and the corridor that leads to the Bridge of Sighs, so named for the last sad breath prisoners would take as they got their final view of Venice. Overflowing with mosaics, marble, and a gold altar it can bee seen that Venice was just as influenced by the east as it was the west..
Have a casual meal at abc Quadri in one of the city’s oldest and prettiest coffee houses or head to the more formal Ristorante Quadri in the opulent dining room upstairs. Ask for a table one row away from the windows for better views of the piazza. Here, art salutes knowledge: Veronese’s Plato and Aristotle, Tintoretto’s philosophers and prophets, the ceiling devoted to disciplines (geometry, sculpture) and virtues (honor, fortune). 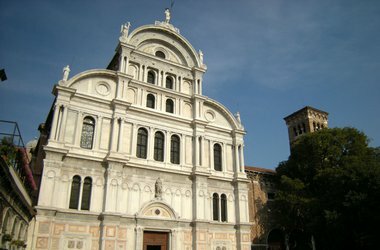 One of the city’s loveliest museums, notable for room after room of paintings about Venetian history. Fra Mauro’s 15th-century map of the world, upside-down and painted on parchment, is dazzling. Take your morning cappuccino and brioche in the piazza or under the arcade at this historic spot, where Venetians have been gathering and gossiping since 1720. 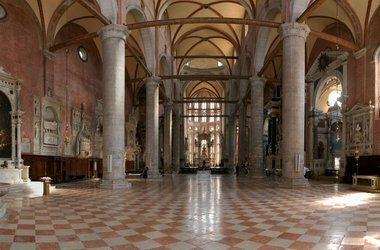 Instead of floor-to-ceiling frescoes, the walls of Church of Santa Maria dei Miracoli are lined with panels of white and grey marble, evocative of a proto-Rothko chapel, giving it a surprisingly modern feel. Look up inside Basilica dei Santi Giovanni e Paolo to see works by Bellini and Veronese. Look down to see the tombs of 25 doges who used to rule Venice. A fun and sprawling book shop, past pretty Campo Santa Maria Formosa, where volumes in Italian and other languages are stacked floor to ceiling – and most dramatically in gondolas. One of the best fish restaurants in Venice specializes in what’s fresh and local. Reservations are a must, as there are very few tables. A museum with a stunning collection of musical instruments, furniture, sculpture, and paintings like Gabriel Bella’s 67 Scenes of Venetian Life. There’s a lovely garden on the ground floor and public reading room and library (with free WiFi) that’s open on Sunday. A beautiful street in a formerly Greek neighborhood that’s close to the chaos of St. Mark’s Square but feels worlds away. Ponte de l’Osmarin is especially picturesque. Say formaggio! 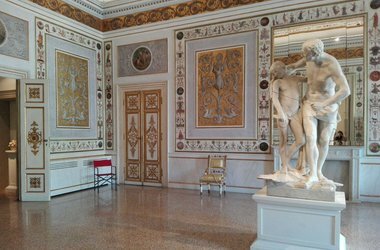 A veritable art museum – paintings by Tintoretto and Vivarini covering every surface, with the occasional break for a marble column. The Chapel of St. Athanasius is lined with ornate carved wooden stalls from the mid 1400s. 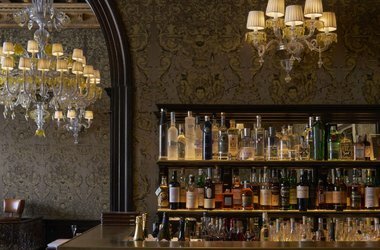 The city’s best people watching is at Bar Longhi at the recently renovated and always glamorous Gritti Palace. Hemingway used to drink here. Of course. Before Guggenheims opened all over the world, there was the Peggy Guggenheim Collection. Picasso, Duchamp, Mondrian, Kandinsky – all the heavy hitters of 20th-century art are on display in her former home. Tucked away in a courtyard down Calle della Vida near Campo Manin you'll find a magnificent spiral staircase reminiscent of a snail (“bovolo”) as well as the Leaning Tower of Pisa. It was built in the 1400s so the Contarini family could show off. (Those Venetians.) You can climb up during the day or just admire from below. Another great way to see it is by moonlight: The marble seems to glow. 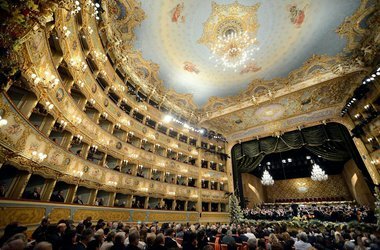 A magnificent opera house that has a full schedule of operas and concerts. Where everyone feels like old friends. Blame the cozy wood beams, the low lighting, the welcoming staff, and, most of all, the seasonally-driven menu inspired by the fishy bounty of the lagoon. 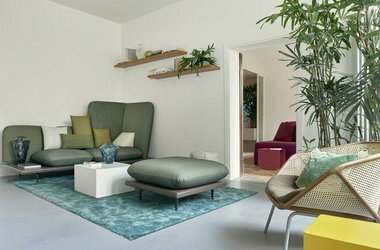 This boutique hotel defines a new concept of hospitality intrinsically connected with design. Renovated in the summer of 2015 by six students from schools like New York’s Parson School of Design, Milan’s Domus Academy, and Venice’s IUAV, the result explodes with vibrancy and elegance. Casa Flora offers an array of services — from homemade breakfast delivery to wine tasting class to an exclusive handmade shoe service. 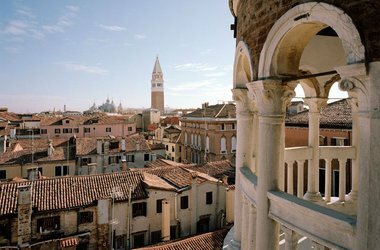 An intimate, grand, and discreet hotel on Giudecca Island with primo views onto San Marco and Punta Della Dogana. 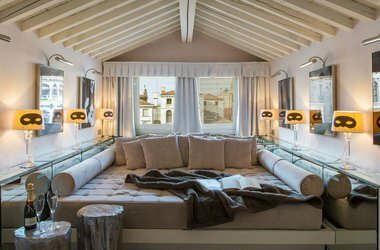 The 16th-century palazzo and former artists’ pensione is now eleven sumptuous mini apartments. Guests have access to the spa at Bauers Palladio across the shared garden. Chic glamour is the mood at the Philippe Starck-designed inn that totally upped the cool factor of the Venetian hotel scene. It’s a big draw for celebs and boldface names, which may be why its Krug Lounge is only open to guests. 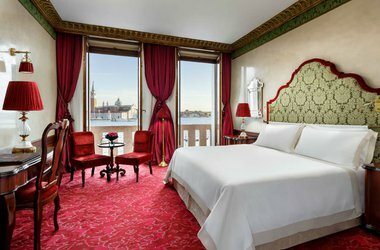 An extensive refurbishment made the 1475 palazzo on the Grand Canal even grander, preserving the original art and objects that fill the 82 rooms and public spaces. The Gritti Epicurean School taught by Club del Doge chef Daniele Turco, the Acqua di Parma Blu Mediterraneo Spa, and the Riva and Longhi bars are excellent reasons not to leave the compound. 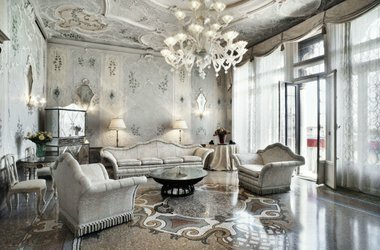 Many Venice hotels boast about being a former palazzo. But Danieli is three. 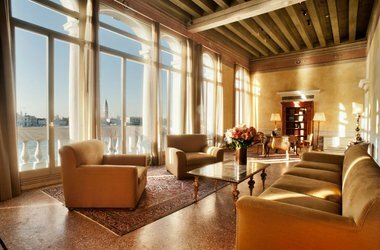 Mere steps from St. Mark's, the hotel is on the larger side, with 210 rooms, a jaw-dropping lobby, and amazing views from Terrazza Danieli are simply amazing. Tucked behind 1950s temple Bauer Hotel is this opulent, exquisitely decorated 18th-century gem. 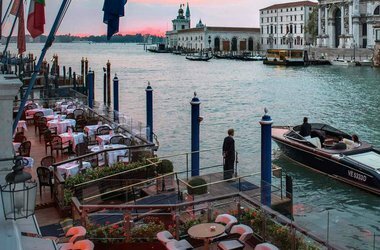 The rooftop breakfast room Settimo Cielo has spectacular views, and canal-side De Pisis restaurant is one of the city's finest. 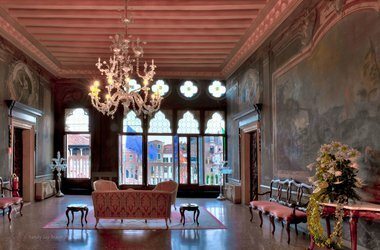 How does it get better than a grand Renaissance palazzo on the Grand Canal with original Tiepolo paintings on the ceilings? You add the signature Aman resorts touches: modern amenities, impeccable service, and attention to every single lasting detail. 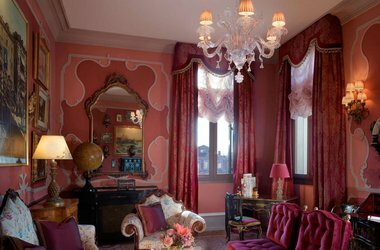 As mesmerizing as traditional Venetian style can be, it can be a bit much. 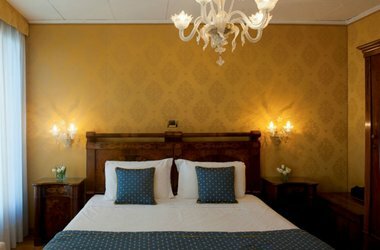 This Castello hotel, a sister property to Charming House DD.724, is the antidote. 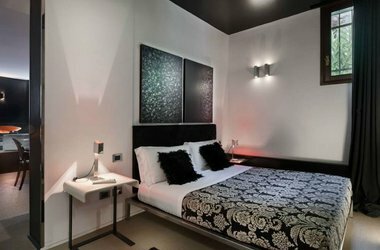 The four modern and sleek suites are the choices for those who don't want an overdone setting. 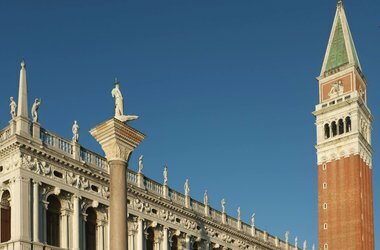 It's a little shabby, but it's not easy to find budget accommodations in Venice. It's pretty — lots of gold and blues, and the San Zaccaria location is great. Is it a palazzo? A museum? A hotel? Si, si, si. The common areas, which are anything but common, are breathtakingly beautiful — frescoed walls and ceilings, Murano glass chandeliers, a dramatic marble staircase. 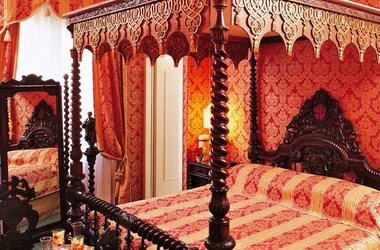 There are 42 rooms; try to reserve one overlooking the Grand Canal. 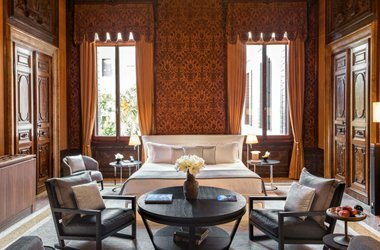 A quiet charmer right off Piazza San Marco where rooms are decorated with a mix of Oriental, Art Deco, and 18th-century antiques. The family's many collections of objects – fans, corkscrews, nutcrackers – fill display cases and line the walls throughout the four floors. 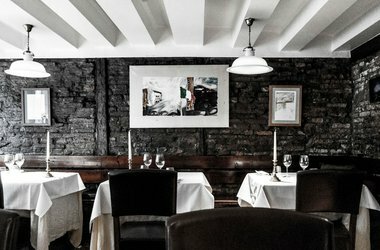 Also on site, Michelin-starred restaurant MET and a chic bar located in the former chapel where Vivaldi taught music. 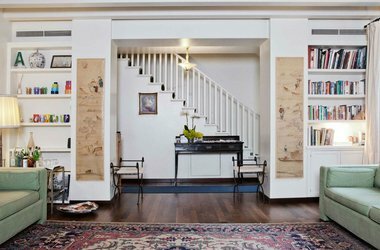 The former home of Alma Mahler is now a quiet hotel in San Polo with six spacious rooms overlooking a beautiful garden and décor that mixes classic and contemporary styles.